NETWORK FINALS: SURVIVOR, THE GOLDBERGS, MODERN FAMILY and AMERICAN HOUSEWIFE all gained 0.1 in final numbers, but SPEECHLESS lost the same, although all of these adjustments were on the borderline of change in hundredths. CABLE HIGHLIGHTS: ESPN’s NBA doubleheader bookended Wednesday cable’s Top 3 slots at 0.74/0.66. Between them was VH1’s BLACK INK CREW, up 0.11 to 0.68, with lead-out BEAUTY BAR up 0.03 to 0.30. On Discovery, STREET OUTLAWS dipped 0.02 to 0.49, and TWIN TURBO was down 0.02 to 0.31. It was a good night for Syfy, which had a 0.42 premiere for its KRYPTON, up from lead-in THE MAGICIANS, which was itself up a tick to 0.29. MSNBC’s RACHEL MADDOW SHOW led the demo in cable news at 0.41/0.58/3.1M, above Fox News’s HANNITY at 0.37/0.55/3.3M, and CNN’s ANDERSON COOPER 360 at0.29/0.37/1.5M. On HGTV, PROPERTY BROTHERS climbed 0.09 to 0.40, HOUSE HUNTERS gained 0.03 to 0.35, and HOUSE HUNTERS INTL was up 0.05 to 0.35. On TLC, MY 600-LB LIFE dropped 0.03 to 0.39, and SKIN TIGHT was down 0.03 to 0.25. TBS’s FULL FRONTAL lost 0.04 to 0.33. The season finale of FX’s AMERICAN CRIME STORY: THE ASSASSINATION OF GIANNI VERSACE rose 0.02 to 0.32. On ID, HOMICIDE CITY dropped 0.05 to 0.28, and SEE NO EVIL was at 0.23. Food Network’s GUY’S GROCERY GAMES fell 0.04 to 0.28. History’s MEN WHO MADE AMERICA gained 0.04 to 0.28. On Lifetime, LITTLE WOMEN premiered a new LA cycle at 0.24, down 0.09 from last week’s Atlanta finale, and GLAM MASTERS was down 0.04 to 0.11. E!’s HOLLYWOOD MEDIUM ticked up to 0.20. On Freeform, GROWN-ISH lost 0.02 to 0.20, and the season finale of ALONE TOGETHER ticked up to 0.09. 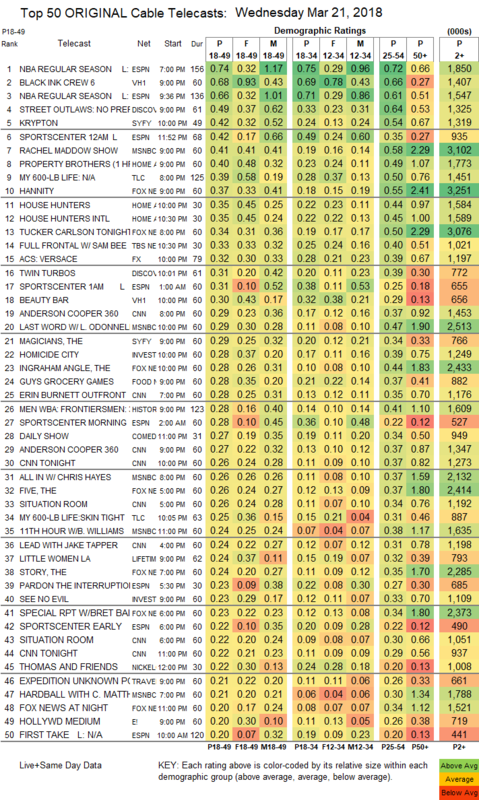 On A&E, STORAGE WARS was at 0.18/0.17, down from last week’s 0.25/0.23. MTV’s FEAR FACTOR was at 0.17, compared to last week’s 0.17/0.15. 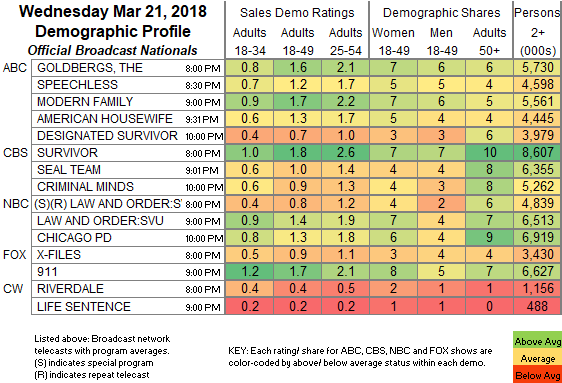 POP’s SCHITT’S CREEK fell 0.02 to 0.08.